Announces the formation of a committee to investigate the sale and distribution of comics in the Hardware City. The Head of the Committee praises the newspaper's previous articles on the controversy. "Group to Probe Sale of Comics in New Britain." 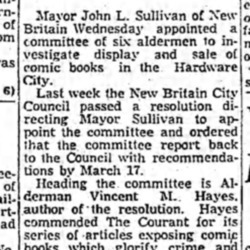 The Hartford Courant, 25 February 1954: 25. Web. 29 July 2018. Unknown, “Group to Probe Sale of Comics in New Britain,” A Crisis of Innocence, accessed April 25, 2019, http://crisisofinnocence.library.ryerson.ca/index.php/items/show/706.